Excellent product for the car. Our 6 year old uses internet for his Nintendo switch screen when we are out and about in the car. It also helps so his head isn’t down watching the screen, which can lead to him feeling car sick!!!! Would also work with a tablet or iPad screen. All in all great product. Perfect exactly what I needed. Simple to use and effective. Would recommend. Viewing angles are also great for both passengers! It is actually a universal tablet headrest mount, but will work with Nintendo Switch. Looks to be made cheaply, will have to try it longer to see if it holds up to a lot of use. But overall seems good. Excellent features it is great for on the go. 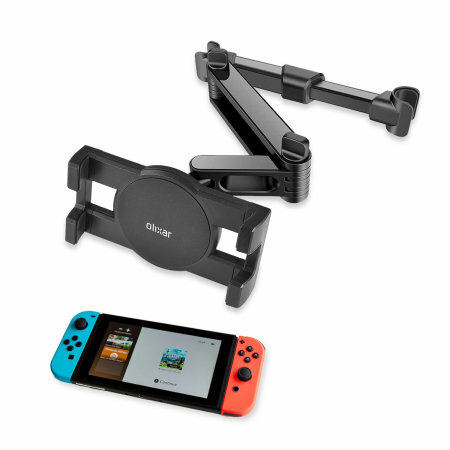 I really like this item and its real easy to install it maybe took me 3 min and that was it.the mount is sturdy its perfect fora Nintendo switch. Just got the mount in the mail. It's a disappointment that this is a Nintendo Switch mount that doesn't fit the Switch! Upsetting! We have tested this ourselves and other reviewers have had no issues. Can you please contact us so we can investigate further. haven't tried t yet but looks perfect for the job. Service was quick too. Thank you. Product works completely as described. Fit the Nintendo Switch perfectly. Bought this for our son to use on trips. Super easy to install and removes quickly. Holds his Nintendo Switch perfectly. We are extremely happy with the purchase and you can't beat the price. My kids now can play the Nintendo Switch while sitting on the back of my vehicle. It does not come with instructions so you'll have to figure it out. The pieces where the Switch sit on can be expanded for a better fit. No fuss dealings and received a good product promptly. This very easy to install car mount fit the Switch safely and securely! My kids played for hours on our long trip!